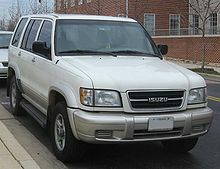 The Isuzu Trooper is a mid-size SUV that was produced by the Japanese automaker Isuzu between 1981 and 2002 and exported internationally as the Isuzu Trooper II, Caribe 442, Acura SLX, Chevrolet Trooper, Subaru Bighorn, SsangYong Korando Family, Honda Horizon, Opel Monterey, Vauxhall Monterey, Holden Jackaroo, Holden Monterey and HSV Jackaroo. In total, there were two generations of this vehicle: the first, produced between 1981 and 1991; and the second (UBS) produced between 1991 and 2002, with a substantial refresh in 1998. Production ended in 2002. The Trooper began as a rather basic and somewhat underpowered on- and off-road vehicle, offered only with four-cylinder motor, four-speed manual transmission, and part-time four-wheel drive. The first generation evolved to add both amenities and luxuries, including optional air-conditioning, power windows, and a more powerful V6 engine. The second generation was even more refined and available in two-wheel drive as well as four-wheel drive. The first-generation Trooper was available as a three- or five-door wagon with independent front suspension. In the Japanese market, the car was originally introduced as the "Isuzu Rodeo Bighorn", but the "Rodeo" part of the name was soon dropped. Early engines included a 1.9-liter gasoline and a 73 PS (54 kW) 2.2-liter diesel, lightly powered even by early 1980s standards for the vehicle's 3,700 lb (1,678 kg) empty weight. The four-wheel-drive system was engaged by operating a three-position shifter adjacent to the transmission shifter. Both Aisin manual-locking and Isuzu's own auto-locking hubs were employed. 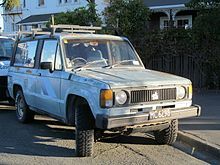 The Trooper was also sold in Australia and New Zealand as the Holden Jackaroo, named after an Australian slang term for a young man working on a sheep or cattle station. The standard Trooper was also sold under the Isuzu nameplate in New Zealand only. In Indonesia, where it was locally assembled by Garmak Motors, it was sold as the Chevrolet Trooper. Around 1987 a two-wheel-drive version called the Chevrolet Stallion was developed there; it has the Trooper's body on the chassis of a rear-wheel-drive Chevrolet LUV. It also has a rigid front axle instead of the Trooper's independent design. There was also a locally developed SUV model of the Isuzu Pickups built in the early 1980s called the Holden Lincah and Holden Raider. While similar to a Trooper in many ways it was a simpler vehicle and has bodywork partially made of fibreglass. In Venezuela was known as Caribe 442. In 1991 for the 1992 model year, Isuzu completely redesigned the Trooper to keep pace with changes in the SUV marketplace, making it larger, more powerful, and more luxurious. These 4,155 lb (1,885 kg) vehicles used a 3.2 L 177 PS (130 kW; 175 hp) (SOHC) petrol engine or 3.2-liter dual overhead cam (DOHC) version rated at 193 PS (142 kW; 190 hp). A SOHC 3.2-liter engine producing 193 PS (142 kW; 190 hp) was introduced in 1996, replacing the earlier DOHC engine in selected export markets. Most models still used a part-time four-wheel-drive system, which required stopping the vehicle to engage and disengage the front axle. Starting in model year 1996, some Troopers came with a "shift-on-the-fly" engagement system. From 1992, the UBS series was available with a pushrod overhead valve (OHV) 3.1-liter inline-four engine intercooled turbo diesel (designated "4JG2") producing 114 PS (84 kW; 112 hp) at 3,600 rpm, and 260 N⋅m (192 lb⋅ft) at 2000 rpm. It was offered as a more rugged and fuel-efficient option for towing and heavy-duty operation, relative to the standard 3.2-liter petrol. The diesel-powered Jackaroo was available with a five-speed manual transmission and manual front hubs only coupled to a part-time four-wheel drive system with open front and limited slip rear differentials. The 3.2-liter V6 petrol engine version was also available with an optional four-speed automatic transmission with automatic locking front hubs. The same diesel engine was also available in the UK and other markets with a belt-driven overhead camshaft, which developed slightly more power. After 1998, and the introduction of the "4JX1" 3.0-liter diesel engine, a four-speed automatic transmission was made available in addition to the five-speed manual transmission. The Australian version of the UBS-series was sold as the Holden Jackaroo/Monterey. In July 1993, Holden Special Vehicles also launched 79 HSV Jackaroo models, which were just a cosmetic upgrade to Holden donor powered by the same 3.2-liter 177 PS (130 kW; 175 hp) (SOHC) petrol engine. Around the same period, Isuzu and Honda established a working relationship that saw Honda sell a rebadged Trooper. The car was thus sold in Japan as the Honda Horizon (1994 to 1999) and in the United States as the Acura SLX (1996 to 1999). Beginning in 1998, the US-spec Trooper became equipped with a DOHC 3.5-liter engine producing 215 hp (160 kW; 218 PS). European and Asian buyers could opt for the diesel engine option of the 4JG2 3.1-liter (later superseded by the more problematic 4JX1 3.0-liter of 159 PS or 117 kW). A Borg-Warner torque-on-demand ("TOD") all-wheel-drive system was introduced, along with freshened styling. The grille was redesigned again for the 2000 model year. Transmission options included a five-speed manual transmission, the Aisin AR5 and the electronically controlled 4L30E four-speed automatic. The 4l30E was fitted with both a "power" shift feature allowing the gearbox to take better advantage of the engine's power by adjusting the shifting nature and a "winter" mode permitting third gear starts for added stability in slippery conditions. The 2000 to 2002 Trooper included a feature called "Grade Logic" which allowed the transmission to automatically downshift on steep grades in order to slow the vehicle down. The suspension consisted of a fully independent torsion bar front suspension, and a multilink coil sprung rear suspension integrated with a solid rear axle. The Trooper LS and S models offered 117.8 cu ft (3,340 L) cargo space, while Limited models had 112.3 cu ft (3,180 L). While US-spec Troopers came only in the 5-seat models, in Europe and the UK seven-seater version was also offered. Optional on all models was a rear limited slip differential. In the US the three-door RS model was sold only from 1993 to 1995. In 2002, the Trooper was discontinued in the United States in favor of the smaller Axiom and the larger GM-produced Isuzu Ascender, a re-badged GMC Envoy. A Trooper with the 16-valve 159 PS (117 kW; 157 hp) 3.0-liter 4JX1-TC engine was sold in the Philippines from 2002 until model year 2005. Known as the Skyroof Edition, it came in a rear-wheel-drive configuration with anti-lock brakes, a limited slip differential, billet-type radiator grille, and large power moonroof. Other standard options included leather seats, wood trim, and a VCD entertainment system. It was later succeeded by the Isuzu Alterra. The "Acura SLX" was a lightly upgraded and re-badged Isuzu Trooper sold by the Acura division of Honda from 1995 to 1999, as 1996 to 1999 year models. Sold only in the United States, the SLX was later replaced by the Acura MDX in 2001. The SLX omitted some of the options available on Troopers from concurrent model years, including the manual transmission and certain engines. From 1996 to 1997 the SLX was only available with the 3.2-litre SOHC or DOHC V6 engine, switching to the new 3.5-litre DOHC V6 engine in 1998. The SLX received a restyled front end for the 1998 model year, but continued to sell poorly and was ultimately discontinued after 1999. It is said that sales were affected by bad press when the 1996 to 1997 models were rated "Not Acceptable" by Consumer Reports for their tendency to roll over during testing. In Europe, the Trooper/Big Horn was sold in Europe as an Opel or Vauxhall from 1992. Called the Monterey, the plate lasted until 1999 on the continent (as an Opel) but only until 1998 in Great Britain, where the Vauxhall badge was used. 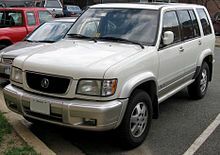 The Monterey name also saw use by Holden in Australia, at first (from 1994) as the top equipment level (V6 only) for what was there called the Jackaroo, but later as a standalone nameplate for the more luxurious part of the range. The Opel, or Vauxhall, was a big hit. The second-generation Trooper received negative press in the United States when the 1995–1997 models were rated "Not Acceptable" by Consumer Reports for an alleged tendency to roll over under testing. In response to a petition from the publication's publisher, Consumers Union, the National Highway Traffic Administration conducted its own tests and found no issue that could lead to a need for a recall. However, the magazine's claims had hurt sales of the vehicle. After the release of the NHTSA report, Isuzu filed a lawsuit against Consumers Union seeking $242 million in damages, claiming that during Consumer Reports's tests the steering wheel had been twisted more sharply than "a driver is willing or able to make in response to an unexpected event. The judge in the suit, Richard Paez, determined that because Isuzu had engaged in an extensive public relations campaign to refute the claims prior to filing suit, it was considered a public figure, raising the standard for defamation from a simple preponderance of evidence that the report was false to "clear and convincing evidence" that Consumer Reports published the article knowing it was false or with reckless disregard for whether it was true or false. The defamation suit went to a jury, which found that eight of the 17 statements in the report questioned by Isuzu were false, with one displaying "reckless disregard" for the truth on the part of Consumer Reports magazine, but that Isuzu was not damaged by that statement. Two of the 10 jurors on the panel did not believe the magazine believed that the other seven statements were untruthful when they published them. Consequently, the full jury panel did not award Isuzu monetary damages for the alleged damage to its reputation and lost sales. Isuzu calculates the total cost of the Consumer Reports claims at $244 million. As Isuzu was denied damages on all counts, the formal court judgement in favor of Consumers Union entered by Paez required Isuzu to pay CU's "reasonable costs" of defending itself against the suit, not including attorney's fees. 1992 – Trooper won class victory in '92 Australian Safari. 1993 – Troopers took first and second place in the class of '93 Australian Safari. 1994 – Trooper won the Marathon class victory at the 1994 Paris–Dakar Rally. 1994 – Trooper finished first in its class at the Pharaoh's Rally. 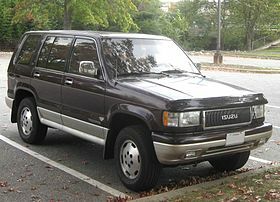 Asia – Isuzu Trooper, also sold by Chevrolet as Chevrolet Trooper. ^ Mastrostefano, Raffaele, ed. (1990). Quattroruote: Tutte le Auto del Mondo 1990 (in Italian). Milano: Editoriale Domus S.p.A. pp. 1255–1256. ^ "Isuzu: Isuzu In The Philippines". Auto World. Archived from the original on 23 February 2011. ^ "Isuzu. Isuzu in Malaysia". Car-cat.com. Retrieved 25 July 2010. ^ "Upgrades to the Horizon Series". Press Release. Tokyo: Honda. 19 March 1998. Retrieved 30 November 2008. ^ "Holden JackarooService Repair Manuals". Onlyrepairmanuals.com. Retrieved 28 October 2012. ^ "Technical specifications for GM 4L30-E" (PDF). Retrieved 27 August 2011. ^ a b "Agency Finds Isuzu Trooper Defect-Free". Los Angeles Times. 26 July 1997. ^ a b "Isuzu sues Consumers Union over report on Trooper". The Daily Courier. 1 August 1997. p. 2A. ^ "Trooper report trips up sale". St. Petersburg Times. 3 November 1996. p. 6H. ^ "Consumer Reports Defamation Trial Starts". The Washington Post. 9 February 2000. ^ a b c "Jury clears Consumers Union". Daily Union. 7 April 2000. p. 3. ^ Pollack, Andrew (7 April 2000). "Isuzu Is Denied Damages in a Lawsuit Against Consumer Reports". The New York Times. ^ Dee-Ann Durbin, Tom Krisher (2 February 2008). "Isuzu to stop selling new vehicles in North America". projo.com. Retrieved 27 August 2011. ^ "Business solutions from AllBusiness-Redesign". AllBusiness.com. Retrieved 27 August 2011. This page was last edited on 7 February 2019, at 18:18 (UTC).